When NASA's Opportunity rover launched on July 7th, 2003, expectations were modest. It would spend 90 Martian days exploring soil and rock samples and taking panoramas of the Red Planet; anything else would be a bonus. Nearly ten years after its initial shift was up, Opportunity is still going strong. Not that it's been an easy journey. While Opportunity hasn't experienced the same hardship as its twin rover, Spirit (whose abandonment was immortalized in this brilliant XKCD comic), it's had its share of troubles. It spent a little over two months trapped in a sand dune before its operators were able to wriggle it free centimeter by centimeter, and it's overcome mechanical problems aplenty. Not to mention the overwhelming loneliness. Despite all that, Opportunity has spent the last 3449 days driving nearly 23 miles around the surface of another world. Its discoveries include the first meteorite found outside of Earth, a temperature profile of the Martian atmosphere, and tiny, iron-rich spheres known as "blueberries" that hint at a time when Mars had water. In fact, Opportunity's most important discovery may have come just last month: A rock that proves that Martian water was once drinkable. Which in turn suggests strongly that life could once have thrived there. 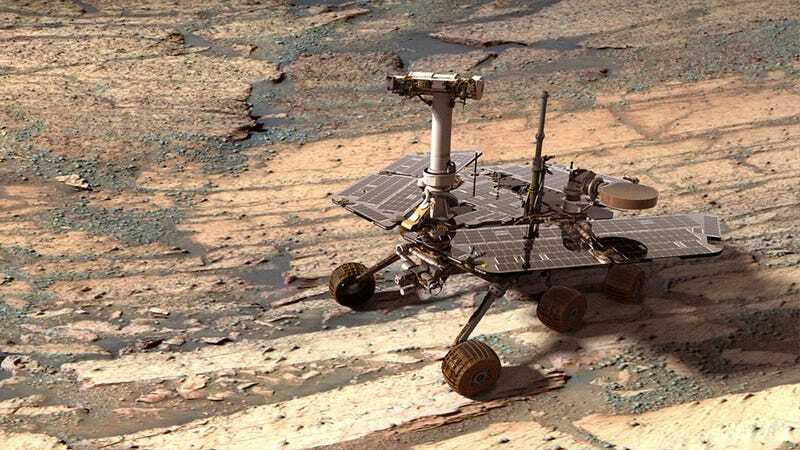 Opportunity's quest is far from over; the little rover that could will keep taking its measurements until it breaks, or gets stuck, or NASA loses its funding once and for all. Godspeed, little buddy. We can't wait to see what the next 10 years holds for you—and for our understanding of the universe.